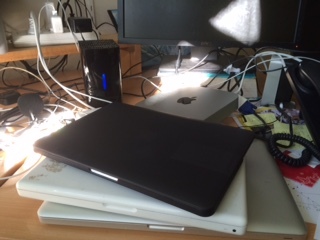 I spend the better part of the last month without a computer to call my own – its a knowledge workers worst nightmare..or at least it was a decade or so ago. Turns out I managed to survive the slow demise into reboot hell of my old machine, the tracking of my new machine through the machinations of a large bureaucratic organisation (university) out to the supplier, the shipping information as the custom build landed on our fair shores, its arrival into one of many loading bays (this is were it spent its greatest period of time BTW), looking at the signature on the receiving docket to find out who to hassle, on to IT who reimage the machine as an SOE (not always a great fit for R&D) and then on to me (to tweak said image), migrate files, passwords and preferences and then I’m happy again. Nearly everything is online now and except for generic email accounts (including the donotreply@… addresses) you can usually find a human attached to as well to keep the whole process moving along. Work wise I seemed to survive quite nicely thanks to the liberal sprinkling (in different physical locations) of incremental backups from the old machine (done hourly) that I could pull files from. My email (a significant chunk of work flow) I had sometime ago aggregated all my email accounts into a single account for rainy days such as these where I could read, query and send (as an alias from) thanks to the kind people at google. Day to day work was carried out, albeit a bit slower, on some legacy (read out of warranty) machines I have floating about and together with a smart phone and tablet that could handle a lot of the day to day communications (and blogging) too. Anyways the new beasty should see me through till its warranty runs out? Why is the warranty so important, it comes down to time, anything out of warranty is a time bomb that none will touch or look at without some $$$ and if something goes wrong these days its the better part of the purchase price of a new machine to fix it anyway. As an engineer sure its fun to fix stuff, but costing up my time, and down time while parts come in, its often not a good trade off and a level of risk to day to day activities. Previous postWearables are here and big brother likes it!